I’ll be adding clips to this post. The following clip is Scott Fraser, Scott Fraser BC NDP Mid Island – Pacific Rim MLA for Mid Island – Pacific Rim which Union Bay is now part of and no longer in the electoral area of Courtenay/Comox. It was certainly a pleasant surprise to see an MLA interested in the challenges facing Union Bay. Scott had some very interesting points to make about the process of joining the Regional District and supplied important information about the financial benefits which are not available to us as an Improvement District. This is my concern regarding Bitten, Loxam and Jacques voting to resurrect the expired 2011 WIA. Listen to his first answer and the answer he provides when I ask him the same question again after Kaljur corrects his version. 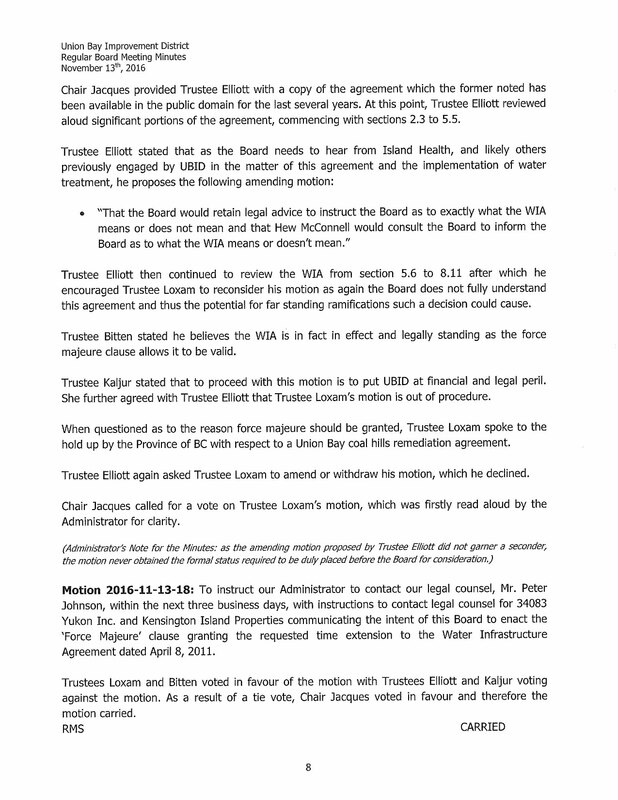 When Bitten, Jacques and Loxam wanted to resurrect the expired 2011 WIA, Elliott tried numerous times throughout the meeting requesting Loxam amend his motion to indicate advice was requested – not to renew the expired agreement and Loxam REFUSED. You can’t change the facts. Here’s a condensed version of the discussion as to the status of the Expired 2011 WIA. 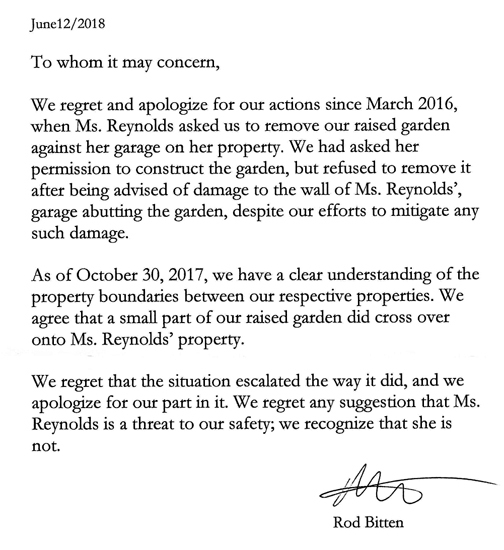 Read the first paragraph below about the Administrator’s comments. The Administrator is the only person out of the six of them who actually knows what’s going on and yet they completely ignore his concerns and push forward. 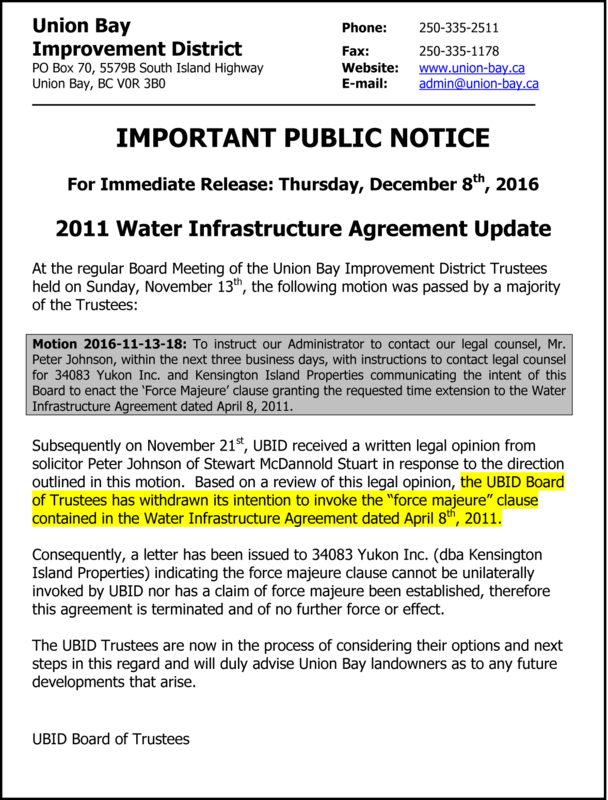 This is not acting in the best interests of Union Bay – this is careless. 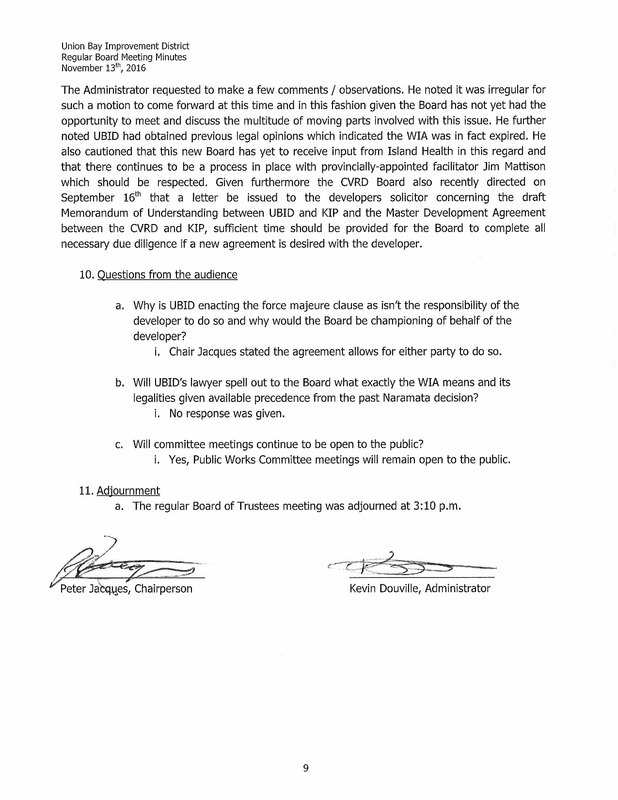 My question is a. from above: “Why is UBID enacting the force majeure clause as isn’t [it] the responsibility of the developer to do so and why would the Board be championing on behalf of the developer?” And I am provided with an answer that is completely wrong according to the letter the board received back from the lawyer advising the force majuere clause cannot be invoked unilaterally. These are the types of sloppy habits that could end up costing us big time. There has to be accuracy and clarity in all legal matters. 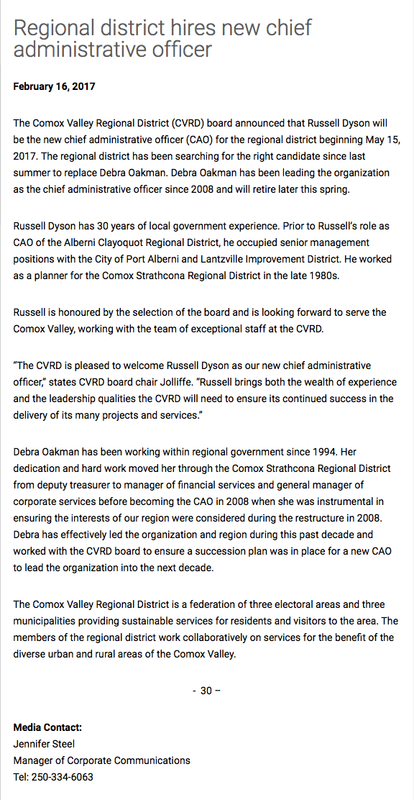 Again, this is another reason to join the Regional District. We simply don’t have the staff and resources for major projects with a neophyte board and administrator. How many mistakes are they going to make because they simply refuse to allow any new information to penetrate or because they are so firm on their beliefs like they were in this very important instance. Naramata landowners paid the money back over 15 years. Let that be a lesson for us. 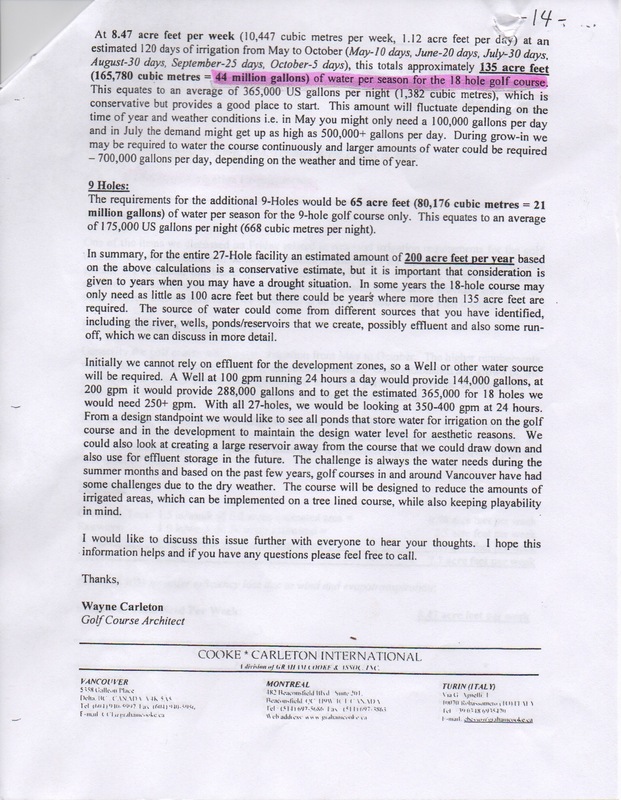 This short video clip is regarding the proposed golf course and where the water would come from. 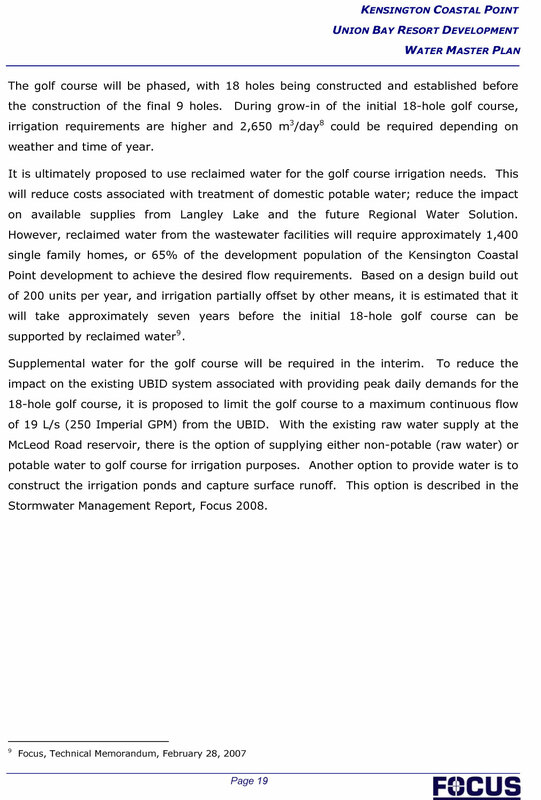 Note: Trustee Bitten states the developer will develop 50 doors over the next 2 years and that the golf course will be watered from the waste water from the sewage plant. Is it mini golf? 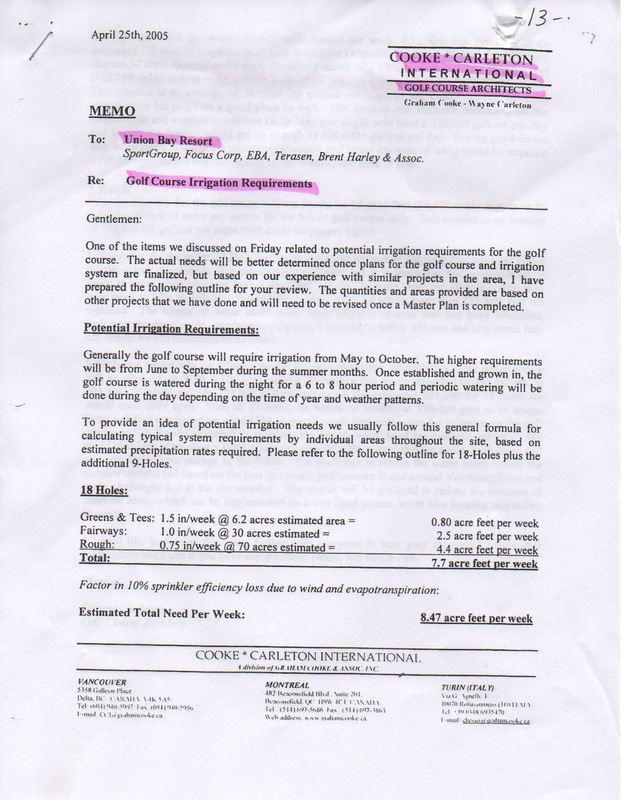 Here’s some info detailing Golf Course Irrigation Requirements specifically outlined for Union Bay Resort – one of KIP’s previous names for the development. On Page nineteen in the above Focus Report for Kensington it states: “Based on a design build out of 200 units per year, and irrigation partially offset by other means, it is estimated that it will take approximately seven years before the initial 18-hole golf course can be supported by reclaimed water.” At 200 units/doors a year it will take seven years to be able to use reclaimed water and we’re talking 50 doors over the next couple of years. 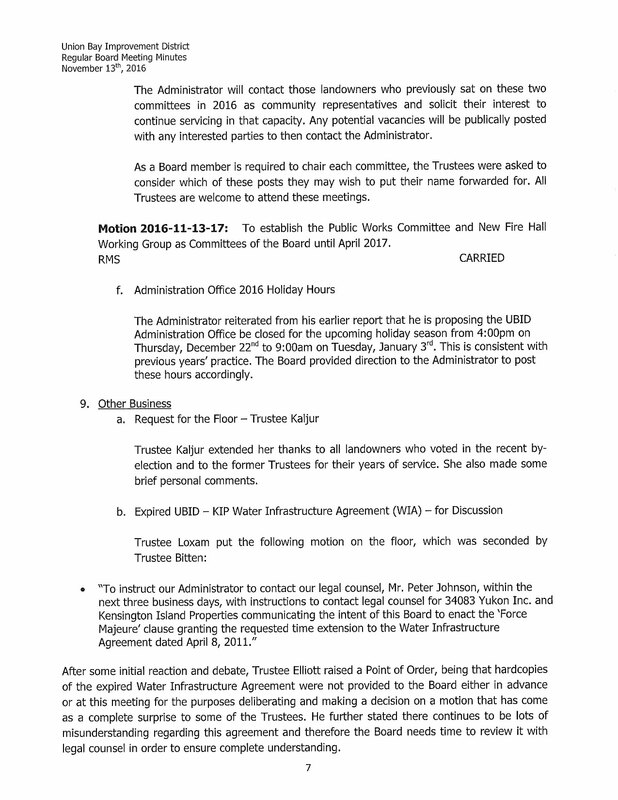 Next Post Union Bay Improvement District Trustees in a Conflict of Interest?